On November 6th, we can elect morally just leaders who will help us end gun violence in America. But only if everyone votes. Here’s what you need to do. Plan a time to go. Before or after school or work? Decide how you’re getting there. Is it close enough to walk? Can you take public transit? If you need a ride, Uber and Lyft are offering discount rides to the poll. Invite people to vote with you. Pick two friends to bring with you to the polls, and text three more friends to remind them to vote! Not registered to vote? WHAT ARE YOU WAITING FOR? *This link will take you to an outside site. Already voted? AWESOME. Help us turn out people to vote! Remind people you know to vote, or post a selfie with the hashtag #VoteForOurLives to help get people to the polls! Here’s more info, thanks to our friends at Rock the Vote! DO I NEED TO BE 18 TO REGISTER TO VOTE? The voter registration age requirement varies by state, but most states allow individuals who will be 18 by the next election to register to vote. Some states do have a minimum age requirement to register to vote (for example you may have to be 17 ½ years of age). Check out the Rock the Vote Election Center for the voter registration eligibility requirements in your state. People over 18 are making decisions that affect the lives of students around the country. We MUST vote for candidates that value human lives over NRA donations. Voter registration deadlines vary by state. Check out the Rock the Vote Election Center for information for the voter registration deadlines in your state. If you’re too young or missed registering for this election, don’t just sit it out! Get people you know to vote on November 6, and make sure you’re registered today for the next one. YES! You have the right to register to vote at your school address – this includes a dorm room. Any student living in a dorm is entitled to the same rights as any other student. To imply otherwise is illegal. Seriously – always look up the official laws, don’t let anyone convince you otherwise with misinformation. If you receive mail in a Post Office box you can sign an affidavit (or, in some cases, get a letter from your college’s Residential Life office) asserting that you live at your dorm address. For more info, check out our Election Center. It depends. Most states require some form of identification either when you register and/or when you vote. The rules vary state by state. As part of your plan to vote, check out your state rules at the Rock the Vote Election Center and make sure you bring what you need to vote. 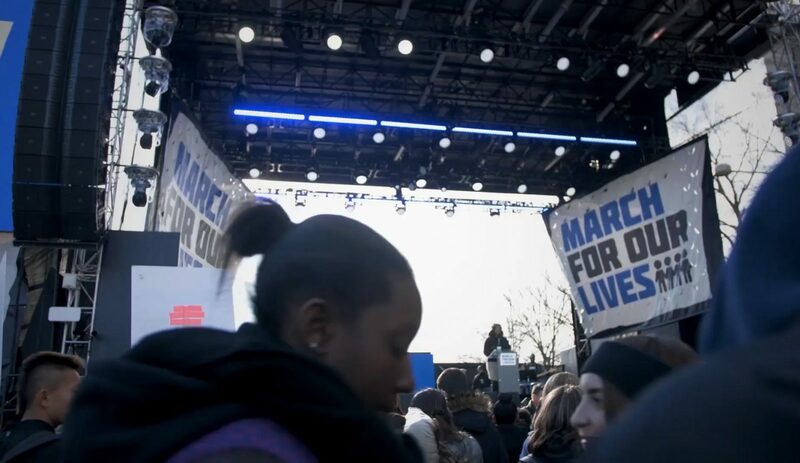 HOW DO I VOTE WITH MARCH FOR OUR LIVES? We’re a nonpartisan group that believes in common-sense gun violence reforms and smart policies over candidates and parties. We recommend you research the candidates before you go vote. Most states will let you look up your ballot for you before you show up at the polls. And if you’re able – join us for Walkout to Vote. We’ll be walking out of class to vote at 10am local time on Election Day. WHAT DO I DO AFTER I VOTE? Wear that sticker like a dang badge of honor. Make sure everyone around you who can vote, does vote. Know that your vote matters and that we thank you with everything we got. Our hope is that so many people show up, not just in this election but the next one and the one after that, that together we elect morally just leaders, and gun violence in America ends, and we work ourselves out of a job.